iMedicineReview – Internal medicine review study courses. Excellent success rates in ABIM internal medicine Certification & Recertification exams for last 12 years. Rewarding experience for practicing physicians and residents from many academic programs. We provide board preparation guarantee. An intense and comprehensive review of internal medicine. State-of-the-art preparation for the ABIM internal medicine board exam. Learn the stepwise approach for management of diseases based on the current guidelines. Live course offers 30 Category 2 CME hours. Discounted fee available for Residents of Internal medicine residency programs and Fellows in training. Special discounts for Chief Residents. A comprehensive online review designed for ABIM Internal Medicine certification or recertification. Contains course material selected from Live classroom courses. Selected material also available via iPad/iPhone Apps. Internists and physicians preparing for the ABIM recertification exam. Medical residents preparing for In-service Exams. Physicians seeking CME; our course offers 30 Category 2 CME hours. -Get the high yield information you need, fast with our 3 days’ intense review course. Courses are three days long. Hours are 8am to 6pm on all three days. The schedule is the same for all locations. There are ample local dining options to choose from. 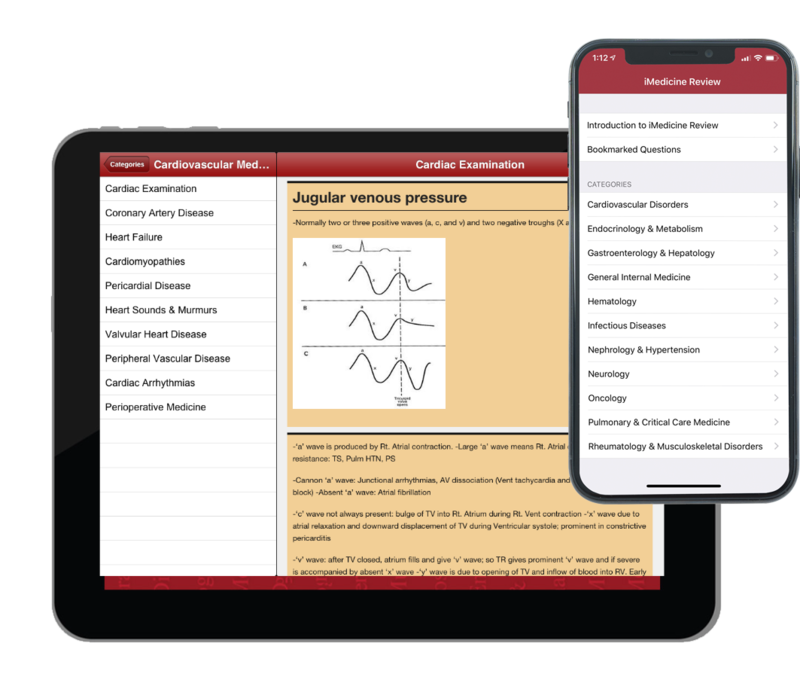 The first and only complete internal medicine review app on iPad/iPhone, it contains high yield course material selected from live classroom courses. Get a discounted price of only $19.99 (50% off for a limited time) if you purchase from your device. Or try the free lite version on iPAD/iPhone. This comprehensive review is designed for internal medicine residents, practicing internists, and sub-specialists who are preparing for the ABIM Internal Medicine Certification or Recertification Examination. It can also be used to prep for internal medicine in-service exams, internal medicine components of USMLE II and III, and for international internal medicine examinations including MRCP, PLAB, RCPSC/MCCQE or FRACP. Enhance your knowledge of the day-to-day practice of internal medicine. Q&A1500™ on iPad/iPhone/Android devices lets you access more than 1,500 study and review questions (more Q&As are added periodically).